Rated: R for strong violence, language throughout, some sexual and drug material. The Kray twins were gangsters in London’s East End during the 50s and 60s. Between the various biopics based on their lives, the autobiographies they wrote separately and together, and the numerous books about their exploits, they are pretty well-known even outside of the UK. 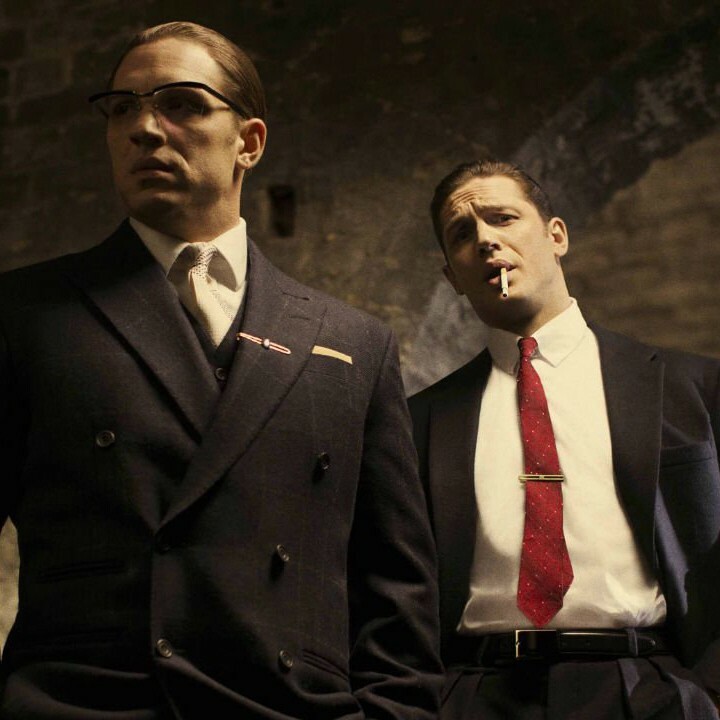 Tom Hardy plays both twins in “Legend,” the latest film version of their story. If you’re on the hunt for a gangster movie, it will hit the spot. Reggie and Ronnie Kray were both notoriously violent. Reggie also had a good head for business, but had to keep his brother under control – Ronnie was schizophrenic and not always willing to take his meds. The film opens with Reggie pulling strings to get Ronnie out of a psychiatric prison. We then follow them as they rise in power, eventually working with the American mob and pushing hard against other local gangs who make the mistake of edging in on their territory. Meanwhile, Reggie courts and wins the heart of Francis Shea (Emily Browning). He struggles to balance the above-board and caring home life Francis longs for with the violence and unpredictability of his work with Ronnie, and their relationship begins to crumble. Tom Hardy plays the twins with his usual 110%, full-throttle engagement. Some of the shots that give us both men in the frame work better than others, but that’s more down to imperfections in the special effects and editing rather than in Hardy’s performances. The whole film is a showcase of Hardy’s range as an actor – he’s chaotic and on edge as Ronnie, cool and collected as Reggie. Both men are frighteninly and intensely violent, but in their own ways, and he uses everything from body language to simple practical effects to distinguish the two men. The supporting cast are solid and the writing is good, but the film would be nothing without Hardy’s performances. Browning makes Francis both sympathetic and strong – she chose poorly when she ignored her family’s dislike of Reggie and went out with him anyway, but she struggles valiantly to both stand up for herself and make the marriage work. There’s a strong vein of humor in the film, which helps to keep it from sliding into overwhelming gritty violence. Much of it comes from the open mockery with which the twins shower their dedicated police investigator, “Nipper” Read (Christopher Eccleston). They wave at him when he stakes out their homes, offer him tea, and engage in cordial banter before cleverly ditching him. This is not a film for folks who think most gangster movies are too gory. “Legend” doesn’t shy away from the violence the twins visited upon nearly everyone they came in contact with, friend and foe alike. Fans of the genre will likely enjoy this latest instance, and Tom Hardy fans who don’t mind some bloodshed must not miss his dual performance.